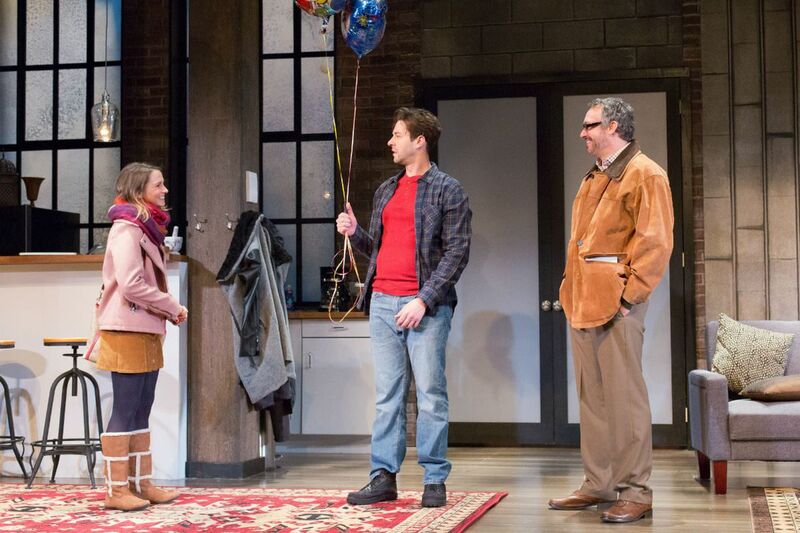 (From left to right) Laura Giknis, Michael Satow, and Danny Vaccaro in “Time Stands Still,” through Feb. 11 at Bristol Riverside Theatre. Imagine a couple whose shared interests once brought them together. Now, their needs are starting to diverge, and they face tough decisions about their future. At the core of Donald Margulies' Time Stands Still is this most ordinary, and relatable, of romantic dilemmas. Here it's gussied up with social relevance – arguments about both the value and pitfalls of reporting and photographing war and its fallout. By now, these polemics have a familiar cast. (Time Stands Still had its Broadway premiere in 2010, and America's martial misadventures in the Middle East have long since come to seem Sisyphean.) But Susan D. Atkinson's elegant, finely paced production at the Bristol Riverside Theatre makes a persuasive case for this well-crafted, if rather conventional, play. Both acts of the two-hour piece take place in what we're told is a loft in Williamsburg, Brooklyn, imagined by set designer Jason Simms as a comfortably middle-class refuge with exposed-brick walls and contemporary décor. The action begins with the return to New York of star war photographer Sarah Goodwin (Eleanor Handley). She's had a near-death experience after a car bomb explosion and is now home to recuperate. The fiercely independent Sarah, effectively underplayed by Handley, has a crutch, a foot cast, a sling, and a face covered with scars. Trying to take care of her is her longtime boyfriend, James Dodd (Michael Satow), a freelance magazine writer who has partnered with her professionally in the past. It turns out that Jamie, portrayed with conviction and emotional verve by Satow, has (less visible) scars of his own. Having left Sarah behind in Iraq after a psychological breakdown, he can't help half-blaming himself for her injuries. In fact, both journalists betray symptoms of post-traumatic stress disorder. Impatient to see Sarah after her homecoming is Richard Ehrlich (an animated Danny Vaccaro), the photo editor of the magazine that's buying her work. Once an item, the two have retained a loving and professionally beneficial friendship. Richard shows up at the apartment with his new girlfriend, Mandy Bloom (Laura Giknis), an event planner. Young and naïve, outfitted in a short skirt and high boots and carrying silver balloons, she seems as though she might be his daughter. By the play's end, though, Giknis has made a case for her, and for her bond with Richard. The characters in Times Stands Still express and embody the various arguments raised by war reporting: Is it exploitative to photograph the carnage of war? Should journalists in extreme situations lay down the tools of their trade and help save lives? Does the American public, war-weary and agog over celebrities and fluff, even care about suffering in the Middle East? Are those who persist in covering it heroes, or primarily junkies in need of an adrenaline fix? Margulies gives each of his characters a sympathetic hearing. In Time Stands Still, whose title refers both to the way a photograph freezes action and to the contrasting need for people to move on with their lives, no one is entirely right or wrong. But they may be wrong for one another. Through Feb. 11 at the Bristol Riverside Theatre, 120 Radcliffe St., Bristol. Tickets: $33-$50. Information: 215-785-0100, brtstage.org.